The Samsung Galaxy Note 4 comes in a box not much taller or wider than the phablet itself. It contains the usual accessories - a powerful A/C adapter that can reach 2A for Quick-charge compatible devices, 1.65A elsewhere, a cable and a headset. Since the Galaxy Note 4 switches back to the microUSB 2.0 port, the cable is your regular microUSB port. The headset is an in-ear design, the remote has three buttons (pick-up and volume controls) and flat, tangle-free cables. The quality of the headset is quite good for a bundled piece - regarding both build and audio quality, although it still can't properly replace an expensive set of headphones that you purchase separately. Curiously, the AT&T version of the device in the United States does not include a bundled headset. Users across the Atlantic will have to spend extra on picking one up. Standing at 153.5 x 78.6 x 8.5mm and weighing 176g, the Samsung Galaxy Note 4 is identical in size and slightly heavier than its predecessor (151.2 x 79.2 x 8.3mm, 168g). The minor increase in thickness is mostly down to the curved glass on top, which requires more space than a conventional flat glass. A comparison, which Samsung would very much enjoy, is the one to the Apple iPhone 6 Plus. The first Apple phablet is slimmer at 7.1mm but has a far more disappointing footprint of 158.1 x 77.8mm despite offering a smaller 5.5" screen. Huawei, on the other hand, would gladly point you in the direction of the Ascend Mate7, which stands at 157 x 81 x 7.9 mm and packs a whopping 6" screen. So, all in all, Samsung did a good job of slimming down the Galaxy Note 3 bezels, but others have done even better. The Galaxy Alpha was called that way because it was the first to showcase the new Samsung design direction - combining plastic back with a metal frame to ensure excellent durability without compromising the premium feel. And while the first attempt wasn't quite perfect due to the glossy plastic used on the back of the 4.7" smartphone, the second attempt is rather impressive. The Samsung Galaxy Note 4 combines a faux leather finish akin to the one on the Galaxy Note 3 with a metal frame, but also adds a curved glass to become a real looker of a smartphone. While still made of plastic, the back looks and feels very similar to leather. The only change here is that the stitching is now gone as the company has apparently taken the criticism to heart that it makes the whole thing look overdone and actually, faker. The new finish feels much closer to leather to the touch, so the imitation is much better this time around. The metal frame feels great to the touch and adds quite a lot to the premium feel. More importantly, however, it should solve a long-standing issue with Samsung handsets where the silver paint on the plastic frames would chip and peel off in time to spoil the overall look of the company's phones. Finally, the curved Gorilla Glass 4 on top of the screen comes to improve the appearance as it looks better than a flat panel, but also, the handling and swipes now feel more natural. We've enjoyed curved glass on top of the screen since the Nokia N9 came around, but it wasn't until this year that they are finally making their way to some properly slim phones, so you don't have to choose one or the other. There's one niggling issue with the design, though. As early adopters found out, there's a gap between the edge of the screen and the metal frame - it's not as bad as initial reports made it look (certainly not wide enough to fit a business card), but it's there and somewhat spoils the design. Not so much at first sight, but there will certainly be dust accumulating over time. Worst of all, the gap's size varies and is not symmetrical on both sides. The AT&T version of the device features slightly different design on its back cover. You get a small carrier logo and full Samsung Galaxy Note 4 branding. As far as we understand, the frame is raised a bit higher than it needs to so it offers extra protection in those cases when you drop your Galaxy Note 4 face down. And while that might be a valid concern, we would have preferred if Samsung sacrificed a tiny bit of durability here to achieve the seamless front panel design. 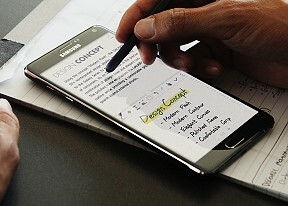 Still, all things considered, the Galaxy Note 4 marks a crucial achievement for Samsung. It's arguably the first time that its device looks better than a direct rival by Apple. Granted, the Cupertino giant didn't quite get the iPhone 6 Plus right, but it's still a position Samsung must've been dreaming about for years and it has finally achieved it - in the hand the Galaxy Note 4 feels more like the iPhone 5S than the iPhone 6 Plus. That's not all, the Samsung phablet also has the lead in handling - while neither phablet is particularly comfortable for single-handed use, the Note 4 with its smaller footprint has an edge. Add the extra phablet experience that the Koreans have, which results in lots of software optimizations (you can even shrink the whole UI to only take about 4" to have everything within reach) and you get a more manageable package. Above the 5.7" display you'll find the earpiece, the newly upgraded 3.7MP F/1.9 front-facing camera capable of 1080p video recording, the proximity sensor, and the ambient light sensor. The IR gesture sensor of the Note 3 is gone as the Note 4 doesn't have the air gestures - obviously, Samsung has decided that polishing those and making them usable isn't either feasible or worthwhile. You only get Air wake up, which wakes up the screen if you wave you hand above the proximity sensor. Under the display, we find the typical Samsung three button layout consisting of a physical Home button with capacitive Back and Task switcher keys each side. As usual, the home button has an aluminum frame for a subtle accent. Despite being made of a new material, the sides of the Galaxy Note 4 aren't anything new regarding controls. There's the power/lock button on the right-hand side on which the thumb nicely rests and the volume rocker on the left. The volume rocker could have been lowered a little bit so as to be more easily accessible. As we mentioned, the Samsung Galaxy Note 4 switches back to microUSB 2.0, but the port is still located at the bottom. The 2.0 port is slower for data transfers, and while we wouldn't say it's too much of a loss on a mobile phone, the sense of downgrading isn't what you may expect from a flagship device. On a positive note, the large unsightly hole required by a microUSB 3.0 connector is gone too. Also at the bottom sit a couple of mics and the S Pen compartment. The top features another mic and the 3.5mm audio jack, plus the IR blaster that Samsung has been putting on most of its flagship Galaxy devices over the past couple of years. Then we get to the back, which is very similar to the Note 3, save for the absent stitching and the loudspeaker grille, which has been moved here from the bottom of the phone. You get the same nice feel of leather, a kind of finish that also proved itself quite durable in the long run. While the position at the bottom seemed like a good thing at first as it's harder to muffle when the phone is lying flat on its back practice showed that it wasn't. The reason was that the speaker on the Galaxy Note 3 would very often end right underneath your finger when playing a game or watching video and you wouldn't be able to hear anything unless you specifically adjust your grip. You can pop the back cover open to reveal the 3,220mAh battery (basically no upgrade over the 3,200mAh unit of the Galaxy Note 3) along with the microSIM and microSD card slots. The slots aren't stacked on top of each other like on the Galaxy Note 4 predecessor but have their separate compartments. However the microSIM slot is still blocked by the battery so hot-swapping isn't an option - changing the memory card on the go is possible, though.